The recent passing of Fidel Castro after a long illness has left many in Hollywood stunned and deeply saddened. As a tribute to the late Cuban Dictator, Michael Moore has said that he plans to make a biopic of the deceased former leader. In an interview with Hollywood Today, Moore was high in praise of Castro. "Castro will stand out as one of the greatest leaders ever to grace the planet. 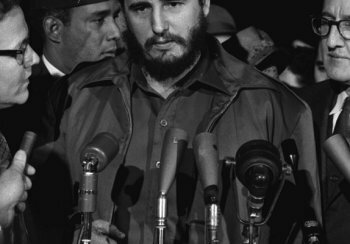 The way he stood up to the evil imperialists the United States and the way he controlled his Cuban people and silenced those who dared to defy him is a testament to the type of strong character that he was. He is definitely a great inspiration to many young progressives and the world had truly lost a wonderful man. This latest film project which I am about to embark on is my personal tribute to him." The controversial Director and Author concluded the interview by saying that shooting for the movie which is simply called Fidel will begin next spring with a release date carded for August 2017. Sean Penn is set to play the title role. i have a feeling i'm not the true audience for this. I didnt not UN-hte this. shite. this is sheer idiocy.